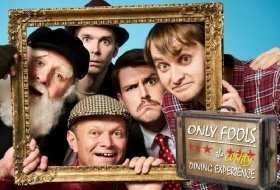 From the producers of The Faulty Towers Dining Experience, Interactive Theatre International is back with another immersive dining experience; this time it’s a tribute to British Sitcom Only Fools and Horses. The production has a residency at the Edwardian Blu Radisson in Tottenham Court Road, as well as performing up and down the UK in various venues. I grew up with Only Fools and Horses on the telly, and I’m am a huge fan of the show so when I heard about this event, I couldn’t wait to get myself down to this event The Nag’s Head Pub Quiz hosted by Del Boy and Friends. When you arrive at the event at 7pm you are guided into a holding room, here you are presented with a cash bar (a 3 course meal is included in the price, so is drinking water) depending on what time you get there you may be approached by “Cassandra” she is looking for Del… You are advised to stock up enough drink for the first half of the show. At 7.30pm Del arrives. In the production, I experienced, Del was portrayed by Nick Moon. Nick Moon is outstanding; it’s as if his whole being has been possessed by Del Boy. His study of the character made famous by David Jason is so on point, it is far beyond any impression, it is just sublime to experience. His craft is worthy of awards and if I’m honest, he makes the production. It’s worth the ticket price just to be in the presence of Nick Moon playing Del Boy. From the moment Del enters the performance space the interactivity starts. As an audience member, you can immerse yourself into the piece as much as you want. What follows is two and a half hours of laugh-out-loud fun. The casting for the production I attended was pretty impressive, alongside the magnificent Nick Moon who plays both Del and Uncle Albert. Maxwell Tyler played Rodney. Luke McGibney took on a trio of roles Boycie/Trigger/Slater and Clare Buckingham portrayed Marlene /Cassandra. All of the performers should be commended for staying in character throughout and interacting with what could be perceived as some very trying audience members. As a scripted piece, the “story” is really well done, it showcases each of the characters, allowing each of them to take center stage and drive the action forward. The relationship between Del and Rodney is brilliant and both Tyler and Moon bring their brotherly love /hate relationship to life beautifully. At one point Moon almost had me in tears (as did David Jason in the \TV show) when the tender moments of their relationship shone. Again I cannot praise Moon enough for both his scripted performance and his ad-libs. I haven’t belly-laughed like this in a long time. As an audience member you are sat in tables of 10, and each of the performers spends time with each table throughout the event, so as well as enjoying the scripted action going on in front of you and around you, you also get to interact with your favorite characters, you may get to flirt with Marlene or Boycie, and if you’re unlucky Trigger may use his Brush to clean your table setting after the first course or you may get chatted up by Boycie. The concept really works well and the performers work hard to make sure that everyone in attendance enjoys the event. There isn’t really any set, apart from a few posters scattered around the room and a whiteboard for the quiz, and the food is okay, but to be honest, when bulk catering for 80 covers, you’re not going to get a Michelin star meal are you. If you’re a fan of the show you will love this, it’s lovely jubbly, British comedy at it’s finest. Perfect for a life event, i.e birthday, If you’re not a fan and you ‘ve just been dragged along you may well feel a bit of a plonker!